Champs Sports is one of the largest mall-based specialty athletic footwear and apparel retailers in North America. Its product categories include athletic footwear, apparel and accessories, and a focused assortment of equipment. This combination allows Champs Sports to differentiate itself from other mall-based stores by presenting complete product assortments in a select number of sporting activities. Its 552 stores are located throughout the United States, Canada, Puerto Rico, and the U.S. Virgin Islands. The Champs Sports stores have an average of 3,500 selling square feet. Cash back terms and exclusions: - No cash back on selected categories. - Coupon codes obtained from sites other than GoCashBack.com may void cash back. 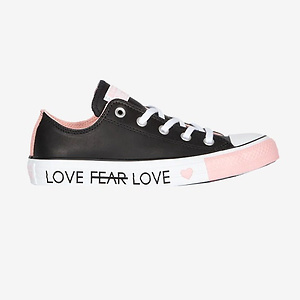 Champs Sports offers ​Converse All Star Love the Progress Ox for $48.75 plus ​receive 25% off your $99 purchase, enter promotion code FLASH25 at checkout. Free shipping on orders over $75.